Calling all Microsoft Dynamics CRM On Premise Customers! Check out our key facts for transition to Microsoft Dynamics 365. 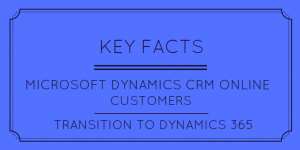 What it will mean for you and how and when you will move… This Microsoft Dynamics 365 Key Facts for CRM On Premise customers helps you specifically as an on premises customer to plan and make the transition. Also don’t miss our free guide offering more facts and advice about the Dynamics 365 licensing. On 1.11.16 Microsoft has ceased to contract Microsoft Dynamics CRM and has moved to Dynamics 365. Read more, where has CRM gone? No. 1 don’t panic. Microsoft is still committed to the CRM functionality and the move to Dynamics 365 only strengthens this product. You have Dynamics CRM 2011 on premise and are paying for software assurance. By doing so, Microsoft sends a confirmation of the software version you can upgrade to. Once software assurance ceases you will not be able to move past the confirmed software version. As a CRM on premises user, if you wish to start using cloud licensing there is a cloud add on product which can be activated at any time, and used in conjunction with your on-premise licenses. We await more information from Microsoft if the on-premise site will need to have transitioned to 365, or if a mix of CRM and 365 will correlate. For on-premises CRM customers wanting to transition to the cloud, you can start that process at any time or wait until your SA renewal. From October 2016, there will be a 40% discount for on-premises customers transitioning to the cloud 365 licenses. The transitional pricing is open to existing CRM on premises customers for 3 years, and once the transition is made, pricing will hold for a further 3 years. For On Premises CRM customers that had purchased a Microsoft Social Engagement “for SA” add-on, at renewal, customers should receive a concessionary price and they can add Enterprise Plan 1 rights, which includes full Social Engagement functionality (this exceeds the capabilities of Microsoft Social Engagement Professional) with the cloud add on, to their SA payments. Alternatively you can move from software assurance offer and drop their software assurance entirely but there is a cost associated. This only applies to existing CRM / Social Engagement customers as at 31.10.16. If you are looking to transition your Microsoft CRM on premises to Dynamics 365 either on premise or in the cloud and need some assistance or want to discuss the differences, please contact us. We support Microsoft Dynamics CRM and Dynamics 365 on premises and work with organisations both big and small over this platform. Are you a CRM Online customer? Check out our blog specifically for you. This entry was posted in blog, Microsoft Dynamics 365, Microsoft Dynamics CRM Features and News by Catherine. Bookmark the permalink.